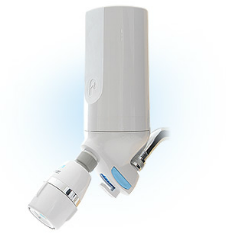 Pelican has designed and built a beautiful shower filter that effectively removes chlorine. It is our chlorine Shower filter and is very attractive & very well made. 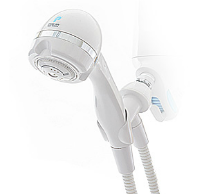 You can select from a shower filter with a handheld showerhead, with a standard showerhead, or a shower filter to which you attach your own showerhead. Please note that we only offer products that do what they should and are fairly priced. From among those items we do offer, the choice of which you prefer is up to you. You can make your choice knowing that any will do what is described effectively. These shower filters have been tested and certified to NSF/ANSI Standards for removal of free chlorine. So for those who consider NSF Certification important, this is a good choice for you. The Pelican showerheads offer an optional “Ocean Breeze” aromatherapy function. Add Scent Bars to your order if you would like this option. See these filters on the Pelican Shower Filters page in the online store. for more information see our page on chlorine risks. Complete Shower Filter only: Use any showerhead you wish. Showerhead sizes are standard. 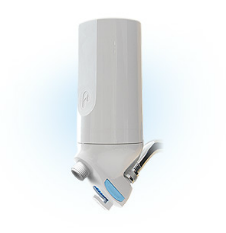 If there is a regular pipe coming into your shower, then any showerhead will fit it – and so will this shower filter. Shower Filter with matching showerhead: Showerhead has two settings for high-flow or mid-flow. High flow is 2.5 gallons per minute, the other option is 2.0 gallons per minute. 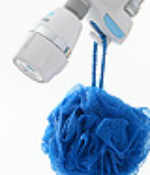 Shower Filter with Handheld Wand: With a 9-jet turbo massage and a 5-foot tangle-free hose. Chlorine serves an important disinfecting role in our water supply. We submit that does not need you should absorb it into your body. We absorb more chlorine from bathing and showering than from drinking water. The EPA has declared that US households have elevated levels of chloroform in the air due to chlorine releases from showering water. Chlorine is a disinfectant that is designed to kill lliving things. It also binds with the protein in your body. Chlorine, in addition to sometimes irritating skin, eyes and lungs – and drying skin and hair, is a suspected cause of breast cancer. The Pelican Shower Filters have been tested and certified to effectively remove chlorine. 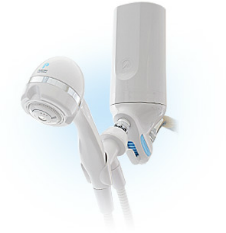 All Pelican Showerheads come with an accessory hook. Kdf, used in this filter, is made of copper and zinc. Kdf works against hard scale, which is that white buildup you otherwise see on your showerhead, shower curtain, and stall or tub. Kdf is bacteriastatic. The carbon included in the showerhead is particularly good at filtering synthetic contaminants and removing unpleasant odors. Far-infrared volcanic material reduces surface tension in the water, allowing increased hydration and softer-feeling water. There is no maintenance required for these shower filters. Just change the filter cartridge when needed. The manufacturer suggests that on average, you should swap out the cartridge every nine months. Our experience suggests once a year is sufficient for most households. Stop absorbing chlorine through your skin and lungs now.